EC Electrical cover many commercial installations and take pride in being able to offer a complete design and advice packages. This kind of co-operation between the client and ourselves means we can help control all aspects of an installation. This is to ensure that all projects are finished on time and within your own budget ensuring a cost effective solution that meets your requirements. 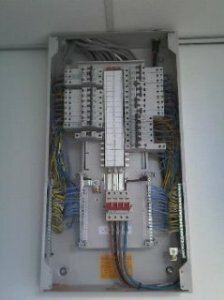 Structured Cabling inc fibre optic. To assist you in getting a qualified electrician, always look for the NAPIT logo.